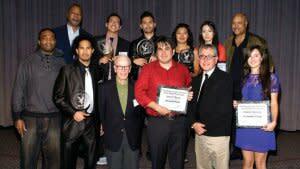 The Directors Guild of America announced on Tuesday the winners of the 2012 DGA Student Film Awards for African American, Asian American, Latino and Women directors. The awards are designed to honor, encourage and bring attention to exceptional minority and women directors in film schools and select universities across the country. This is the 18th year the awards have been presented. According to the DGA, the awards rules require that competing films must have been made in the 2011-2012 school year (September 2011 through August 2012), and must have been produced as a student project under the supervision of a faculty member. Dramas, comedies and documentaries are eligible, but animated and experimental films are not. Applicants must be enrolled in, or be a recent (one-year) graduate from, an accredited post-secondary institution in California or DGA-selected university offering a degree in film or television. Eligible films are those in which a student held every major crew position. Productions in which a non-student, a professional or a faculty member served as cinematographer, camera operator, sound recordist, editor, lighting designer or screenwriter may be disqualified. The award-winning films were screened and the awards presented in a ceremony at the DGA Theater in Los Angeles on Thursday, Nov. 8 and will be screened and presented in a ceremony at the DGA Theater in New York on Wednesday, Nov. 28.